The history of Bill’s car is as follows: It was built on 5 / 6th June 1963 and was despatched to North America on 7th June. As one of the early models it has the 'fridge door' style of door handles commonly known as “pull handles”, listed extras included heater, wire wheels, whitewall tyres, folding hood and an ashtray!! It eventually came back to England in 1989 as 'a basket case' and was totally restored, still using original body shell and also original 3 bearing engine. This was done by Gordon Parker near Little Fencote. I then purchased it in November 1990, it then had age related number AEF948A, but I then changed it to MG2505 in November 94. Since then it is pampered nearly as much as Mavis!! Has had the wire wheels changed to Minilite style knock-ons and the engine changed to a 5 bearing one. 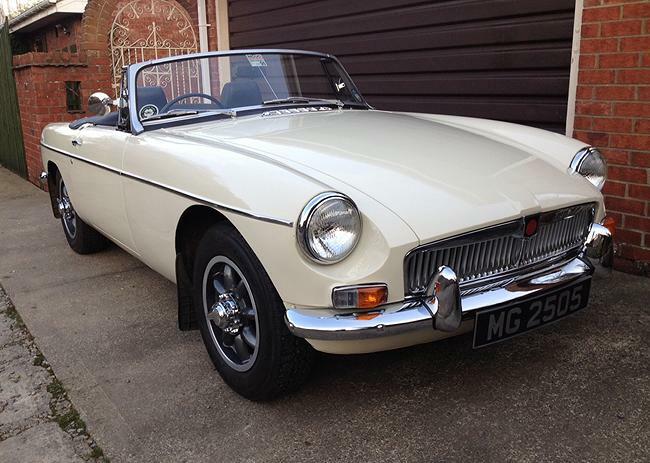 We thoroughly enjoy using it for summer use, having toured Southern Ireland many times with the MGOC Travel Club. Oh pure joy.